This has been the most important part of self-care for me. 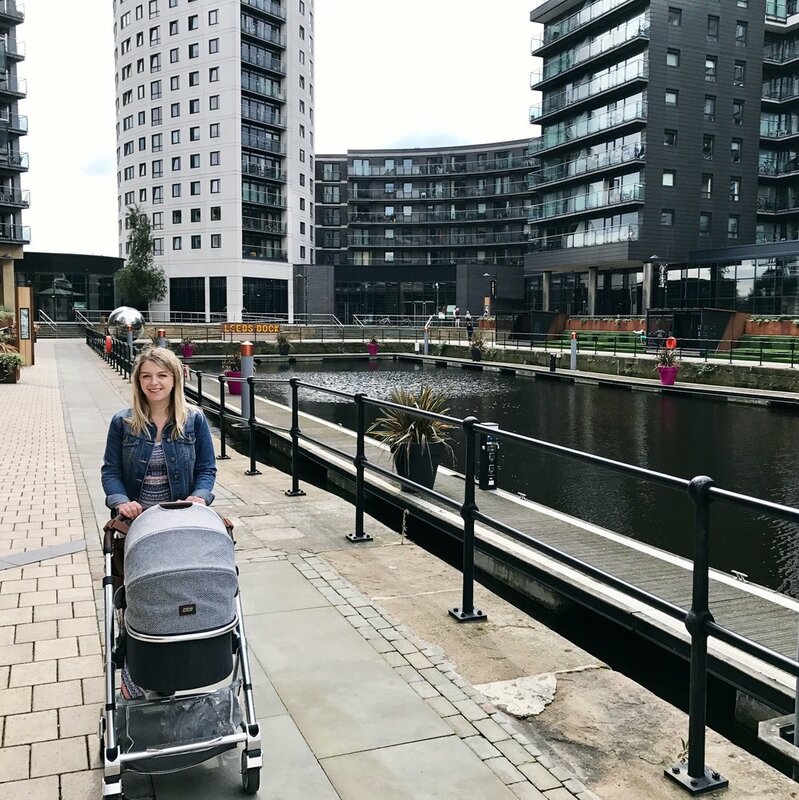 Whether it's your own mum popping over for the day to give you a break, or just a WhatsApp group of other parents who you can use as a soundboard during the night, having a gang of people around you during this time is crucial. That gang obviously include your partner, too, and whilst it's tempting to think that you know your baby better than anyone (which you probably do), handing them over to your other half even if they don't rock them to sleep exactly the way you would will give you the time you need to look after yourself. Accepting help is hard at any time, but it's essential to your survival and self-care. This maybe controversial, but I let my baby cry if I really need to. I'm not into 'Cry It Out' as a parenting method, but if I really need the bathroom or to grab a drink, then I let him cry whilst I sort myself out. I only do this for things that take a minute or two, but it's easier than trying to juggle him whilst I make a sandwich - and there's no way I can care for him all day without eating. It felt really wrong the first couple of times (that cry really is piercing...), but ultimately I always go back within a couple of minutes to give him a cuddle (or whatever else he needs) and he's hardly neglected in the grand scheme of things so I figure we can both live with this arrangement. Everyone has their own priorities when it comes to self-care. I find that I feel a hundred times more capable when I've had a shower in the morning, so rather than sleeping when he sleeps, I prioritise getting clean. In fact, I've not really napped since he's been born - I'd personally rather go to bed early with him rather than napping in the day, but for other people a nap might be the lifeline they need to get through the day. You know yourself best, so whether it's a cup of coffee or a short stint of yoga, prioritise the basics you need to get through. However, there is a caveat to that... When you get a chance, don't forget the things that make you feel good that aren't just the very basics. For me that's baths, reading books, blogging and baking (like the good 1950s housewife that I am...) - so when I do get a chance, I try to remember to do the things that make me feel like myself rather than just a mum. That first trip out is so daunting. I was so anxious I almost cried, and we were only walking ten minutes up the road. I *did* cry the second time we went out to the park, because I just felt so overwhelmed. Home feels safe and easy, but being cooped up is no good for your mental health (or at least, it's not for mine). It gets easier to leave the house, and I've been trying to at least go on a short walk each day. A bit of gentle exercise combined with some fresh air, and you'll feel like a whole new person, I promise. Obviously budgets are a little tighter than usual when you're on maternity leave, but if you can afford it then an occasional lunch out is a great form of self care. Even if you have to eat with one hand whilst juggling a sleeping baby, someone will bring you food to eat and then clear up after you - which is pretty much a miracle, isn't it? This weekend, self care looked a whole lot like caterpillar cake. Like any good grammar school girl, I've always put a lot of pressure on myself to be 'perfect', which tends to mean bringing freshly baked goods whenever I visit someone's house, or invite someone to mine. This weekend, though, I gave myself permission to buy a cake instead - a birthday caterpillar cake for the birthday girl in question. Cake is cake, after all, and after two nights of broken sleep and a hectic week at work, I just couldn't bring myself to drag myself into the kitchen. And you know what? The world didn't burn to the ground. My friends didn't love me any less. And we still ate cake. Being pregnant has been a game changer in so many ways, but it's really made me take a step back and prioritise self care. In the original sense of the word - not bubble baths and scented candles and manicures, but remembering to eat, getting some basic exercise and all that jazz. You know, the stuff that actually keeps you alive and able to function. As someone who has previously enjoyed good health, both physical and mental, it's been a bit of a learning curve and I suspect it will only become more so as this baby makes himself more at home. I've always been able to 'push' myself on the occasions that I've needed to; whether that's late nights or early mornings for work or play, I've been able to ignore what my body's telling me if I've needed to. Obviously that's not a sustainable strategy for life, so it's not been something I've done much - but I could if I wanted to. Now? I just can't without suffering the consequences quite severely. Me and my body have had to become a bit of a team, working together rather than against each other. Things are a lot easier if I give my body what it wants and needs, even if that means missing out on a night or two. I didn't expect growing a baby to take up so much time and effort. I kind of thought it was going to take place in the background, and I would mostly get to carry on as normal. Oh, how I laugh at poor, naive past Amy. Despite not requiring any *active* participation, your body's going through a whole mess of stuff and I've definitely found myself a lot slower over the past few months, even as I've felt better from all the morning sickness and whatnot. I am slower at walking, at turning over in bed, and there's so much 'baby stuff' to be thinking about that I'm always a little bit distracted. Gone are the days of blogging until the early hours (jk, my bedtime is always 10pm at the latest), cooking everything from scratch and packing my diary full of plans. It's the caterpillar cake all over again. Sometimes you have to pick and choose what you can do, because you can't do everything. There are some things you just can't avoid in life; work and chores are on the top of that list for me. I need to turn up to work every day and continue to do a good job, and I need to keep my house vaguely clean & tidy, and make sure we have some food in the cupboards every week. On top of that, other obligations are pretty much optional. Gone are the days of heading out after work every night for some such or the other event or gathering, I've worked out through trial and error that two is my maximum. That includes my volunteering commitments and my yoga class. And if I exceed that number for some reason (usually work meetings running late), then I need to have a free weekend or I will eventually cease to function. It's a good reminder to give yourself some space in the calendar for rest and recuperation - and is probably applicable to pre-pregnancy Amy, too... she just tended to ignore it. Are you eating healthily, getting some exercise, sleeping the right amount... most of the time? It can be easy to beat yourself up if you let something slip for a day or two, but if you take a wider view of things, you're probably doing okay. A takeaway every now and again, or an occasional late night is not the end of the world as long as you follow the rule and try to do better most of the time. Over the course of a week, or a month, or a whole pregnancy? As long as you're looking after yourself for the most part, those slip ups will fade away in the big picture.